Two months ago, my CEA levels (tumor markers) doubled, so I'm going to get follow-up blood work this morning. As a reminder, a pre-cancerous polyp was found last year at the site where my colon was rejoined (anastomosis), so my oncologist is being precautious. After a wonderful day of interviewing two local colon cancer survivors for a colon cancer awareness video I'm producing with EnFocus Media, I get a voice mail from Mayo Clinic. I have more blood work and a chest CT scheduled on Jan. 23 to rule out metastasis to my lungs. I thought I'd be able to handle going to my appointment alone this morning, but I've been so anxious these past few days! My sister was kind enough to go with me. The chest CT is negative. In order to find out the cause to my rising CEA levels, my next step is a colonoscopy and then a PET scan. Cheers to no metastasis! Prep day today via fasting and cleansing! You'd think I'd be used to colon preps after 9 years of undergoing annual colonoscopies! *NOT* It's the worst part of getting a scope, but at least I'll have a flat tummy in the morning. Feeling confident about tomorrow's colonoscopy. The gastroenterologist found several polyps and obtained biopsies for lab diagnosis. Colonoscopy was incomplete due to a blockage. May have to re-do procedure. Feeling disappointed. Follow-up meeting with oncologist on Valentine's morning. Polyps are benign! I'll still have to re-do the colonoscopy as the prep was "inadequate." So, instead of a one-day prep, I'll have to prep two days out with clear liquids only and on the morning of the scope, nothing to eat or drink except for the final 1/3 gallon of oral GoLytely for a final cleanse. Colonoscopy scheduled for March 6. Very excited! My Be a Blue Buddy colon cancer awareness campaign goes LIVE on the crowdfunding website this Mon., Feb. 17! My mission is to educate others about colon cancer, the importance of screening and early detection. I've garnered both FL Governor Rick Scott and City of Jacksonville, FL Mayor Alvin Brown's support! Both proclaimed "Dress in Blue Day" on March 7. It's the first time for our city! Governor Scott also recognized March as National Colorectal Cancer Awareness Month, making FL a Blue Star State for the first time in at least two years. "Like" the Be A Blue Buddy Facebook page! Great news: Removed a few polyps during last month's colonoscopy and CEA levels are finally decreasing again. Happy to donate $1,500 to Colon Cancer Alliance's Blue Note Fund from my fundraising campaign...PLUS a $1,000 gift from the Lion's Club! Staying busy delivering colon cancer awareness presentations for the next two months! As I write my keynote speech and organize my Powerpoint presentation for the upcoming National Cancer Survivors Day/Walk On Cancer Support event on June 1st, I find myself reliving and feeling all of the emotions I felt during some of my darkest moments while undergoing chemo treatments. Whew! I've come a long way! P.S. Shout-out to Knights of Columbus Council 5535, Jacksonville Beach, FL for their charitable contribution my colon cancer awareness campaign which was donated to CKay Streight's Walk On Cancer Support. Just had an MRI of my lower back and hips. This is my third or fourth attempt at getting answers since 2009, when I first tripped and fell during a run. A band of back pain radiating from hip to hip, coupled with a loss of sensation in my feet and my left foot in particular having a mind of its own, is making every day walking, much less running, frustrating for fear of tripping or falling. Disheartened that my main oncologist doesn't think it's chemo-related. I cry "BS". Too many in my colon cancer Facebook groups have mentioned similiar pains and loss of sensation. I've seen a neurologist, physiatrist (not psychiatrist), an orthopedist, a sports orthopedist, and gone through physical therapy all at Mayo Clinic where I go for all my post-chemo checkups. Hoping this particular orthopedist at the Jacksonville Orthopedic Institute will find answers. If not...I've got an appointment lined up in Oct. with Mayo Clinic's Spine Center (several months wait!). ** Is there ANYONE in the country who specializes in post-chemo side effects, i.e. degenerative arthritis pain in neck, lower back, hips and leg; and tripping/falling due to neuropathy? ** And despite these issues, I realize 'tis a small price to pay for having a second chance at living life. MRI revealed lower back disc degeneration of L3 and L5, and spinal stenosis. This is nothing new from my last scan sometime in 2010 by a Mayo Clinic physiatrist. And with this, my current orthopedist suggested that my pain is not coming from my lower back, but instead may be stemming from the sacroiliac (SI) joint. 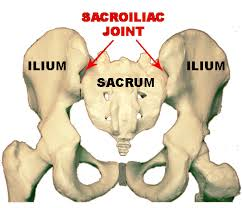 Our next step is to try a steroid injection in the SI joint. A new symptom popped up several days ago--both of my lower arms have been going numb, and the orthopedist put me on a six-day treatment of MethylPrednisolone, a corticosteroid to help reduce any possible inflammation in my neck area. We'll re-analyze when I go back in for my post-injection checkup. Excited! I'm visiting with my good friend Connie who lives up in Cherry Valley, IL for the next few days! Flew in yesterday. Gorgeous temps--in the low 80s. Nice relief from the 107 heat index in Jacksonville, FL! Last night was scary...soon after eating dinner at a fish camp, I started feeling like I do when I've eaten shellfish, like I'm about to undergo anaphylactic shock. Perhaps they cooked my fish in the same oil or pot as their crab or shrimp? I dunno. Now, the tip of my tongue is numb. What the heck is going on? Today, I checked into my the office for my SI injection, with an initial 8 on a pain scale of 1-10. All I can say is "WOW!" --the local anesthetic was extremely painful, and I thought I'd pass out! I could imagine the needle going deep, deep down into my bones, and I thought I was going to pass out! The SI injection itself was probably only painful because the injection site was the same area of my pain. By the time I started noticing lots of pressure from the shot, the procedure was done--maybe 3 minutes total. After a 10-minute "rest" in the recovery room, I was able to walk with minimal pain, minus the pain from the injection site. I was given a log book to record my pain levels for one week. Restrictions include no physical activity for the next 48 hours. Follow-up with orthopedist in two weeks. Of course, I'll keep you apprised on the appointment results. Thank you all for your positive energy! 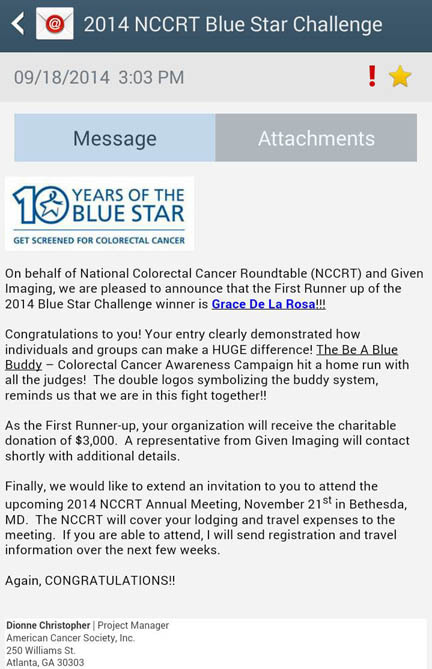 I'm so honored and pleased to win Runner-Up (second place) in the 2014 National Colorectal Cancer Round Table (NCCRT) Blue Star Challenge! I will be donating all $3,000 of the proceeds to Colon Cancer Alliance (CCA)'s Blue Hope Prevention Award, a financial assistance program for individuals and family members in need of colorectal cancer screenings. My sister shared a wonderful quote with me; a quote that truly tugs at my heart strings and reflects how I feel each and every time I can be of service to the colorectal cancer community, whether it's by corresponding with newly diagnosed patients or their family members through my online cancer journal, social media, or CCA's Buddy volunteer program...OR by speaking with groups and organizations to help raise awareness and educate the public about colon cancer, the importance of screening and early detection. The quote below inspires me to continue doing what I thought was a one-time event this past March 2014 (National Colorectal Cancer Awareness Month)--advocating, raising funds for CCA, and spreading the word. Giving hope. Saving lives. Because Screenings Save Lives. Rough day yesterday! Thank goodness my sis was with me when my tongue, face, arms, and legs started going numb on me! She called 911, and it took less than 5 min for paramedics/EMTs to rule out a stroke! Just got back from dr.'s office and concluded the "episode" was an allergic reaction to a six-day treatment of MethylPrednisolone (corticosteroids) followed by my SI injection all in nine days' time. I'm leaning more toward a delayed allergic reaction to the MethylPrednisolane which I started on 08/28. Because the following day, after dinner with friends up in IL, I wasn't feeling well and thought it might be due to my fish dinner being cooked in the same oil or pot as some shellfish...AND my tongue started going numb on 08/29. MRI of the neck will be scheduled just as soon as health insurance approves procedure. I'd like to know the cause of the numbness in my arms. Perhaps it's related to all of my lower back/SI and left foot issues. Connecting the dots...let's do it!